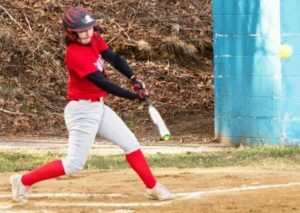 FOUR-YEAR VARSITY SOFTBALL – VOTED ALL – EASTERN CONNECTICUT CONFERENCE AT SHORTSTOP IN 2016 & AS PITCHER IN 2017. FOUR-YEAR VARSITY BASKETBALL – VOTED ALL – EASTERN CONNECTICUT CONFERENCE IN 2017. THE BUZZ: EMILY IS AN ALL-AROUND ATHLETE WITH A COMPLETE GAME. SHE IS AMAZINGLY VERSATILE. 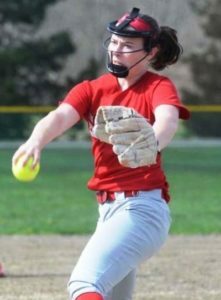 SHE PITCHES WITH GREAT SKILL FOR HER HIGH SCHOOL TEAM AND IS THE PRIMARY SHORTSTOP FOR SHORELINE STING 18U. EMILY PITCHES, AS WELL, DURING THE SUMMER AND FEATURES A “COMMAND AND CONTROL” STYLE WITH GREAT ACCURACY. SHE MIXES A FASTBALL, CURVE, CHANGE-UP AND SCREW BALL. SHE FEATURES GRIM DETERMINATION AT SHORTSTOP HANDLING EVERYTHING LATERALLY AND IS ALWAYS WILLING TO HOLD HER GROUND AND STICK HER NOSE IN ON TAG PLAYS AT SECOND BASE. ALTHOUGH A SMALL PACKAGE, SHE IS A POWERFUL HITTER WITH GAP AND HOME RUN POWER. SHE RUNS THE BASES WELL AND HAS AN EXCELLENT OVERALL SOFTBALL ACUMEN. EMILY IS A TOP STUDENT IN THE CLASSROOM AND ON THE FIELD. SHE IS A GREAT TEAMMATE, WHO WOULD BE A GREAT ADDITION TO ANY COLLEGE PROGRAM.